click on the poem to read. Tuy Sobil, or K.K., right, a former gang member from Long Beach, Calif., founded the club after being deported in 2004. PHNOM PENH, Cambodia — It may be the only place in Cambodia where the children are nicknamed Homey, Frog, Floater, Fresh, Bugs and Diamond. Tach Piseth, 11, practiced spinning on his head at the Tiny Toones break dancing club in Phnom Penh, Cambodia. The club teaches about 150 youngsters. And there are not many places like this small courtyard, thumping with the beat of a boom box, where dozens of boys in big T-shirts are spinning on their heads and doing one-hand hops, elbow tracks, flairs, halos, air tracks and windmills. And, of course, krumping. It is a little slice of Long Beach, Calif., brought here by a former gang member by way of a federal prison, an immigration jail and then expulsion four years ago from his homeland, the United States, to the homeland of his parents, Cambodia. The former gang member is Tuy Sobil, 30, who goes by the street name K.K. The boys are Cambodian street children he has taken under his wing as he teaches them the art he brought with him, break dancing, as well as his hard lessons in life. K.K. is not here because he wants to be. He is one of 189 Cambodians who have been banished from the United States in the past six years under a law that mandates deportations for noncitizens who commit felonies. Hundreds more are on a waiting list for deportation. Like most of the others, K.K. is a noncitizen only by a technicality. He was not an illegal immigrant. He was a refugee from Cambodia’s Khmer Rouge “killing fields” who found a haven in the United States in 1980. He was an infant when he arrived. 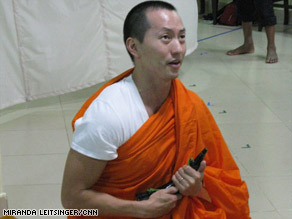 In fact, he was born in a refugee camp in Thailand and had never seen Cambodia before he was deported. But K.K.’s parents were simple farmers who failed to complete the citizenship process when they arrived. Like some children of poor immigrants, K.K. drifted to the streets, where he became a member of the Crips gang and a champion break dancer. It was only after he was convicted of armed robbery at 18 that he discovered that he was not a citizen. Like many deportees, he arrived in Cambodia without possessions and without family contacts. He was a drug counselor at first and then founded his break dancing club, Tiny Toones Cambodia, where he now earns a living teaching about 150 youngsters and reaching out to hundreds more. With the financial support of international aid groups like Bridges Across Borders, based in Graham, Fla., he has expanded his center into a small school that teaches English and Khmer and computers in addition to back flips, head stands and krumping, or crazy dancing. Some other deportees have found work that uses their fluency in English, particularly in hotels. Some have reunited with families. But many have slipped into unemployment, depression and sometimes drug use. “Some were doing well initially but now over time have become unemployed or never did get employment, and just got discouraged,” said Dimple Rana, who works with Deported Diaspora, which is based in Revere, Mass., and helps deportees adjust. K.K. stands out as a success, both in finding a calling and in embracing his fate. 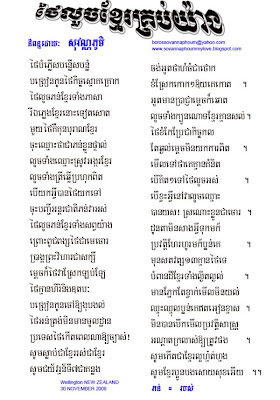 He has a fair command of the language, unlike some deportees who arrived with no knowledge of Khmer. K.K. is in touch with his relatives in Long Beach but has not seen them since he was deported. “I try to tell them not to judge people by the way they look,” he said. “I still have a struggle here in Cambodia. People judge me. People see me with tattoos and think I’m a bad guy. His journey between identities reached a point of strangeness when he was invited last December to perform with some of his students at a Christmas party at the United States Embassy. “The American ambassador gave me a handshake and a hug, and asked me one day when his kid is a little older he wanted to put him in my school,” K.K. said. The ambassador at the time, Joseph A. Mussomeli, recalled the performance as “great fun,” but he said the piquancy of the moment had not been lost on him. “You are right that there is a certain wonderful irony to him being ‘rejected’ or at least ‘ejected’ from the U.S. and still landing on his feet — or shoulders and head — dancing,” Mr. Mussomeli said in an e-mail message. Now another irony is in store for K.K. His club has been invited to send dancers to perform in the United States — Cambodian boys who speak no English and have never left their country. The real American among them, K.K., deported and excluded from the United States for the rest of his life, must stay behind. Sopagna Eap competes in the U.S. Olympic Marathon Trials in Boston in April. Great performance at New York. Was it a smooth, comfortable race for you? "I switched from feeling good to not-so-good, but I think I'm starting to get stronger with the marathon because I expected to the hit the wall at (mile) 20 or 21 and it never happened. I was grateful for that because the wall is always painful." You grew up in San Francisco where running conditions are better. What was it like training in the heat and humidity of the Lowcountry? "When I first moved here, I couldn't breathe. I'd never been exposed to heat and humidity. I didn't think I was going to make it. I was struggling and all the runs I did were terrible. I'd do intervals (speed workouts) and they (laps/intervals) were much slower than usual ... I didn't know where all the water fountains were, so I eventually went out and bought a (hydration) belt. Then it got cooler and I felt better." You were born in a refugee camp in Thailand near the border of Cambodia. Tell me about that experience. "I was 8-months-old at the time (when they left) and don't remember anything, but my parents lived through the Kmer Rouge, then the Vietnamese invaded Cambodia and they lived through that. When the Vietnamese left, the country had to rebuild itself ... They (her parents) crossed the border on bicycles from Cambodia to Vietnam and my dad speaks multiple languages, which helped. The refugee camps were filled with Cambodians and (my parents) pretended to be Vietnamese. Then through the refugee system, we made it out ... I'm glad I don't have any memories of the experience." "I realized pretty early that I could run well. I was pretty active. I played different sports, but running was a better fit for my body type." Which sports did you play? (Laughs) "I played basketball and volleyball — which is fine when you're 13. My strength in those sports was that I had a lot of endurance." Tell me about running at the University of California-Davis. "I got a partial scholarship. At the time, it was a (Division II) school and wasn't allowed to give full scholarships ... I ran the 3K and 5K. I also ran cross-country, but I didn't do as well at that. I think it's due to the fact that I have a smooth turnover and when it's interrupted, I don't run as well. I'm not a strength runner." You went to the University of Oregon for your masters and PhD. Is Eugene running heaven? "It's pretty much running heaven ... I wasn't even planning on running competitively post-collegiately. I moved to Oregon and didn't think it would effect me the way it did. But everyone is so enthusiastic about running and there are plenty of places to run." How did you get into marathoning? "I did it because my husband (Todd Braje) — my boyfriend at the time — was an ultra-marathoner and convinced me to run it (2005 Green Bay Marathon). He ended up getting injured and I did it myself. I figured if I wanted to make the 2008 (Olympic Marathon) Trials that I might as well ... I ran a 2:52 (third place overall female), but I hit the wall at mile 15." You already had your sights set on the 2008 Olympic Trials? "I don't remember exactly how I knew about the trials because at the time I didn't know much about running (opportunities)." "I got my (PhD) degree in clinical psychology but we have a year to do a clinical internship. My husband (also an academic) was applying for jobs too, so we knew there was a good possibility that we wouldn't be able to coordinate locations ... I came out here and interviewed and really liked the program. He ended up getting a job in northern California. My internship ends at the end of July." Are there any races that you are looking at doing here? "Definitely the Cooper River (Bridge) Run. I wanted to do the Turkey Day Run, but it's been so hard balancing everything and I need a little break to re-charge. I didn't even really want to do New York, but it ended up helping me stay sane and center me." What do you think of the running scene here? "I was really surprised when I first came here. I didn't think there would be much of a running scene. I've met a lot of runners and active people ... Still in different parts of Charleston, I feel abnormal running. I've been yelled at running on a path of a (Charleston Municipal) golf course. This guy was really upset that I had the nerve to be on the path, but there were no sidewalks — so what could you do?" Where are your favorite places to run here? "I like the West Ashley Greenway. I definitely wish all the mile markers were up, but that's OK. For short runs, I like the Battery. It's really nice out there." Cambodia and Laos have agreed to complete the planting of 14 more border pillars by 2009. Both countries have also agreed to use the 121 temporary border pillars as the official permanent border demarcations. 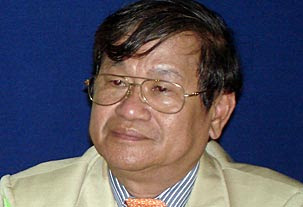 Foreign Minister Hor Namhong (pictured) said on 28th November, 2008 that both countries have agreed to use the 121 temporary border pillars as the permanent border demarcations. The 121 border pillars represented 86% of the border pillars to be planted along the borders between the two countries. The agreement happened after PM Hun Sen proposed that both countries should use the temporary pillars as the permanent border demarcations because they were strong enough which only need some reinforcements. The other 14 unplanted pillars will be completed in 2009 and the border issues between Cambodia and Laos are expected to be permanently resolved. The Most Ven. Dhammathero Sao Khon issues cordial invitations to the Buddhist monks, laypeople and Khmer compatriots to join with the Community of Khmer Buddhist Monks-United States to walk for peace, human rights, territorial integrity and inviolability of Cambodia, especially the continued disturbance and harassment of the livelihood of the Buddhist monks, devotees, people and temples along the borders, on Wednesday December 10, 2008, in front of the United Nations Headquarters, New York City, United States. In the Lower East Side of Manhattan there lies a hidden gem that is slowly but surely etching its mark into the culinary world. Ratha Chau, the owner and chef of Kampuchea (the old name for Cambodia) told me that it has no relationship to the communist organization that was formed in 1970. Chau initially immigrated to America to study psychology but found himself being drawn to food. He wanted to create something unique and enjoyable for New Yorkers as a tribute to the street food of his native country. The menu is based on traditional flavors and classic Cambodian cooking techniques, and then takes it a step further with respect to culture and flavors. Chau explained that everything must be fresh because Kampuchea’s food is a combination of cooked and raw ingredients. The menu is not fusion; it is novella. This reflects what Chau experienced and tasted growing up in Cambodia. Menu items reflect the tastes of southern Cambodia combined with other regional influences. Although Kampuchea is small and cozy, the atmosphere is lively and upbeat. It is rustic yet modern with Asian oak communal tables, stools-only seating, tin ceilings, and steel fans—all of which serve to create a comfortable atmosphere for your dining experience. Cambodia is one of the few countries in South East Asia that is underpopulated. It is a peninsula surrounded by Thailand, Laos, Vietnam, and the South China Sea. About half of the country is a tropical forest. The country overall is rich with produce and seafood which is portrayed in the country’s cuisine. Chef Chau (ex Blue Water Grill, Asia de Cuba, and Fleur de Sel) decided to take the plunge to open this Cambodian restaurant without realizing that he would create an incredible interest for diverse diners, who would travel distances to experience Kampuchea. The menu is original and creative. It was originally developed by Chef Chau and Scott Burnett, Chau’s partner and executive chef. The menu is comprised of five sections—from small Cambodian plates, crepes, Num Pang (Cambodian sandwiches), grilled items, and Katieve or noodle dishes. This diverse, eclectic menu is a delight to the epicure, as it awakens every taste bud of the palate. The grilled sweet corn is a recommended starter—grilled corn smothered with chili mayo and coconut flakes. It’s very light. It could have a South America touch, but the bottom line is that it’s delicious. The Lyche martini is another excellent way to start out. It is very subtle, and not too sweet or boozy, making it a nice compliment to the flavorful and spicy food. My friend and I decided to share some of the signature dishes, including the Mussels, Tamarind Baby Back Ribs, and the Num Pan sandwich tastings. The Oxtail Soup is something that should not be overlooked on a cold day either. All were rich with very distinct and wonderful flavors. The mussels were cooked to perfection and combined with tomatillos, hot peppers, and raw vegetables with cilantro—providing a contrast of sour and spicy. The dish also comes with a semi-thick gravy to dip your bread in. The baby back ribs were comprised of an outstanding combination of special ingredients—Doruc pig, known as red pig, is poached for four hours in apple cider vinegar and smothered with tamarind sauce complemented with pickled vegetables with different contrasting flavors—sour, salty and hot. New Yorkers are so lucky to have the world cook for them in their backyards. All of the proteins are made from naturally raised animals. Kampuchea does not serve desserts, but with such a wonderful variety of eclectic foods who needs dessert? The oxtail stew with tamarind, green papaya, and raw vegetables was my friend’s favorite. The sandwiches were also up there as they made for a very nice close to the dinner, leaving one feeling warm, happy, and healthy. Not too heavy with a pleasant aftertaste reminding you that you just had a stellar meal. Lunch: Friday through Sunday 12:00 p.m. to 4:00 p.m.
Dinner: Tuesday through Thursday 5:30 p.m. to 11:00 p.m., Friday and Sunday 5:30 p.m. to 12:00 a.m. Sunday 5:30 p.m. to 10:30 p.m.
Mr. Hor Namhong (pictured), Cambodia’s Deputy PM and Foreign Minister, said on 28th of November that the current political turmoils in Thailand could affect border talks and the demarcation works to be carried out in December. Mr. Hor Namhong said that the Thai laws require that all agreements regarding territorial matters must be approved by the parliament. Mr. Hor Namhong said that at the moment no one knows how much the political situation in Thailand has improved. Cambodia and Thailand started the border negotiations after Thai troops invaded the Preah Vihear areas on the 15th of July, 2008 which led to military confrontations and, in some areas, have led to border clashes between the Khmer-Thai armies. At the same time, numerous border talks have not led to any troop withdrawal that could return the situation to normalcy of the pre-15th July, 2008 status quo. Officials from the opposition party have today requested the parliament to review the draft documents for foreign aid because the amount of foreign aid requested is equal to 100% of Cambodia’s Gross Domestic Product (GDP). The opposition’s statement has been made at the same time as when the Cambodian government is preparing to meet donor countries to request for $US500 million in foreign aid. However, Mr. Cheam Yeap, a member of the ruling Cambodian People’s Party, said that all requests for foreign aid have always been reviewed by the parliament. Last year, Cambodia has received $US690 million in aid. This year’s planned request for aid was made at the same time as when the donor countries, such as America, the European Union and China, are facing world economic crisis. But Mr. Cheam Yeap is confident that the donor countries will give aid to Cambodia amounted to $US500 million as requested by the Cambodian government in a meeting of the donor countries to be held in Phnom Penh on 3rd of December, 2008. The French ambassador, Mr. Jean Francois Desmanzieres, said on Thursday that the current world financial crisis will not impact much on the granting of development aid to Cambodia for the 2009 financial year. Police trying to clear the protesters from the airports. (Japan Economic Newswire Via Acquire Media NewsEdge) PHNOM PENH, Nov. 28_(Kyodo) _ Cambodia on Friday urged that a summit of the 10-member Association of Southeast Asian Nations, scheduled to be held in mid-December in Thailand, be "postponed" due to political unrest in that country. Hor Namhong, deputy prime minister and foreign minister, told reporters that postponement of the Dec. 14-17 summit in Chiang Mai "is necessary because of the current situation in Thailand in which there is no one is able to manage it." Long-running anti-government protests in Thailand have led to the closure of its two main airports, sent its Cabinet into hiding and paralyzed its parliament, leaving fellow ASEAN members increasingly concerned as the summit date approaches. Hor Namhong noted that on Wednesday, after a summit of leaders of Cambodia, Laos and Vietnam held in Laos, Lao Foreign Minister Thongloun Sisoulith, in the name of the three countries' leaders, sent a letter to ASEAN Secretary General Surin Pitsuwan, asking him to consult with Thailand and other ASEAN member states on whether the summit schedule should be maintained or postponed. While there had yet to be any "official response" from Thailand on the matter, Hor Namhong cited media reports that quoted Thai Foreign Minister Sompong Amornwiwat as saying his government would take its ASEAN partners' suggestions into consideration. Sompong, stuck in Germany after Thailand's main international airport closed earlier in the week, reportedly said he would discuss the matter with Thai Prime Minister Somchai Wongsawat, with his ASEAN counterparts and with Surin. Earlier this week, Singapore Foreign Minister George Yeo told reporters "a cloud of uncertainty" hangs over the ASEAN summit due to the unrest in Thailand, according to Channel News Asia. "We are very troubled by it. We hope that all groups in Thailand will have the political will to compromise and find a way out for the country. The tourism industry is badly affected. I worry that the ASEAN summit will be affected," Yeo was quoted as saying. The Jakarta-based ASEAN Secretariat issued a statement Thursday acknowledging that "queries have surfaced as to whether the 14th ASEAN Summit will be held as originally scheduled in mid-December in Chiang Mai, Thailand." "The Secretary-General of ASEAN...is currently on his way to clarify this matter with Thailand, which currently holds the chairmanship of ASEAN. The ASEAN Secretariat would issue a statement once there is a definite clarification on this matter," it said. Leaders of Laos, Vietnam and Cambodia signed yesterday a Vientiane Declaration on strengthening the development triangle co-operation and approved the joint agreement of the fifth summit. These were a part of mechanisms to further their co-operation on development triangle area discussed at fifth summit of the Prime Minister Bouasone Bouphavanh of Laos, his Vietnamese and Cambodian counterparts Nguyen Tan Dung and Samdech Hun Sen in Vientiane on 26 November. At the summit, the joint co-ordination committee has also signed the MoU to build the policy for attracting and provision of facilities to promote trade, investment and tourism in which the mechanism has been asked to determine in order to realise the said MoU. Mr. Bouasone Bouphavanh, Prime Minister of Laos has said that the signed agreements are very importance and significance because it would be a fundamental principle as well as the key reference for the member country to develop the development triangle area with sustainable, richness and prosperity manner. He added that in order to reach the goal of development triangle, the member country has to double work, particularly to increase the fund to develop the infrastructure and human resources. During the event, the three sides has agreed to build the forum for business sector and propose to organise the meeting for leaders of three countries with business sector at the next summit. Laos and Vietnam has expressed thanks to Vietnamese government for its great assistance on human resource development. They also agreed to encourage the exchange visit of youth leaders from three countries and considered to organise the meeting for the youth leader of the three countries during the next summit. On this occasion, the leader of the countries has unanimously agreed that the 5th CLV summit held in Vientiane on 26 November has reached with highest successful and met the target goals. In addition, the three PMs agreed to propose the ASEAN Secretary - General to ask the Thai government to confirm the hosting of 14th ASEAN Summit. PHNOM PENH, Cambodia (CNN) -- A man strums an electric guitar while another musician blows on a buffalo horn converted into an instrument. A boy performs the traditional Cambodian monkey dance spliced in with breakdancing beats while a singer raps to the moves. The lead male character, Sam, rehearses in a Phnom Penh studio in early November. The artists are rehearsing for Cambodia's first known contemporary rock opera, "Where Elephants Weep," which makes its world debut Friday in Phnom Penh. The production, loosely based on a classical Cambodian love story and performed in both English and Cambodian, is part of a bid to revive the arts in the Southeast Asian country, where most artists died under the Khmer Rouge, an ultra-Maoist movement bent on building an agrarian utopia. "I think when any culture is interrupted by the tragedy of war, it's particularly important to go back and visit those (ancient) traditions, but we are in the 21st century and it's also important to bring those traditions forward," said John Burt, the show's executive producer and founding chair emeritus of Cambodian Living Arts, which commissioned the production. "Where Elephants Weep" is the tale of two Cambodian-American men who return home after surviving the 1970s genocidal Khmer Rouge regime to reconnect with their roots but are confronted by the tragic past as well as an unfamiliar modern Cambodian society. One of them ends up in a pagoda and ultimately dead, while another falls into a doomed love affair with a leading local pop singer. Those worlds can be seen in the dance, where American and Cambodian choreographers fused traditional Cambodian dance, including using shadow puppets cut into the shape of elephants, with the back spins and handstands of breakdancing. The music also parallels the east-west journey of the two male protagonists. Composer Him Sophy, who studied in Russia for 13 years after surviving the Khmer Rouge labor camps, has blended rap, religious chanting, rock, his country's ancient music, operatic styles, pop and even added a Khmer Rouge propaganda song as a cell phone ringtone in the production. Two musical ensembles will perform on the stage: a traditional Cambodian one that includes some 37 instruments such as the long-neck guitar and a one-stringed instrument; and a Western rock band outfitted with drums, an electric bass, piano and synthesizer. "I knew before that it would be so difficult for me as a composer because traditional musical instruments are never played in big performances, Cambodian musicians never read (musical) notes, they don't work with a conductor and especially related to the tune -- the pitch of traditional instruments -- it's not enough tune to perform with the rock band," Him Sophy said. To resolve the tune issue, the composer said he and his team "reinvented" some of the Cambodian instruments, such as the buffalo horn -- believed to be used for some 1,000 years to call elephants. "The commission of this opera ... was to inspire and invite him (composer Him Sophy) to bring his own voice of the ancient Khmer sound into his own score that married his traditions with western pop and rock tradition," Burt said. Most of Cambodia's artistic traditions had been passed down orally, from teacher to student, up through the 1970s. But a majority of the country's artists were some of the at least 1.7 million people -- nearly a quarter of Cambodia's population -- who died under the Khmer Rouge from execution, disease, starvation and overwork, according to the Documentation Center of Cambodia. Five of the regime's former leaders are awaiting trial before a U.N.-backed tribunal for war crimes and crimes against humanity. The loss of Cambodia's artists spurred efforts to find survivors who could instruct future generations about the country's ancient arts, some of the instruments of which can be seen carved on the temples of Angkor Wat, which are up to 1,200 years old, in Siem Reap. Cambodian Living Arts now has 20 master artists teaching nearly 400 students, plus an archive sound studio. The group is expanding its efforts to include commissions of new work, such as the rock opera. Him Sophy lost two brothers to the Khmer Rouge. One of the songs he composed for the production, "No Mother," is about those who lost their parents under the Khmer Rouge, and the main character, Sam, has suppressed many of his painful memories of being a child soldier during that era. "Of course, the tragedy for Cambodian people, I cannot explain it all, but I would like to show it through the opera," he said. The story is not just a reprisal of the country's tragic past, but a look at it today: there are scenes of beer girls and nightclubs, Buddhist religious ceremonies and a planned traditional arranged marriage, and the newly rich living in freshly-acquired luxury homes. Burt said a Cambodian-American friend inspired him to bring forward the story of those refugees who go back and "land in this very betwixt and between place, where they are not really American, they are not really Cambodian." The cast includes Cambodian-Americans, one who said the experience has been a homecoming of sorts for her. When Amara Chhin-Lawrence, 27, came to Cambodia for the project in 2003, "it was very much a feeling of being at home ... because there wasn't this dual nature anymore." "This is where I feel like my yearning for my homeland will rest," she added. Burt, who had to have a theater renovated to accommodate the size and scope of the show since there was no suitable venue in the country, aims to take it to other cities around the world but believed it was important to have the world premiere in Cambodia. "Cambodia soon will and should have the stages that can welcome international touring shows, that can welcome the shows of their own people, and our hope is that this show really raises the possibility for that to occur," he said. The creative team also hopes audiences will view Cambodia differently after seeing the show. The production presents "Cambodia in the light that it so urgently needs to be shown in," Filloux said. "And that is not in terms of the Khmer Rouge regime, not in terms of looking in the rearview mirror, but in looking towards the resilience of spirit of Cambodian people, at the enormous challenges that they have faced and how their art and their sensibility and their spirituality can utterly transform them." "Where Elephants Weep" runs through December 7. The garbage dump in Cambodia's capital spans eight football fields and is more than 100 feet deep. Its stench in the hot humidity of Phnom Penh carries for miles. Cambodian Children's Fund founder, Scott Neeson, received the Ambassadors for Children Peace Award, given by the World Food Program, this year for his work with Cambodian youth. Steung Meanchey, the massive dump, offers up scraps of glass and metal that children gather and sell, making less than a dollar a day -- enough for one bowl of rice. Many live in shacks made of bits of wood and plastic. It is where the poorest of Cambodia's desperately poor children eke out a living. With nowhere else to go, children head to the dump as a last resort. Many have lost their parents and this dumpsite is their lifeline. While on vacation between jobs in 2003, former top Hollywood executive Scott Neeson saw the dump's devastation for the first time. "It shattered my world. It was like walking from the best parts of west Los Angeles, where I was living, to the apocalypse," Neeson said. "It's worse than anything you can imagine. There are body parts, there are chemicals. I found limbs. I found fetuses, chemical waste. There are rats, all sorts of sinkholes that people disappear into." Peak hours between midnight and 4 a.m. are the most crowded and dangerous times at the dump. There's an average of 24 children every day who are backed over by the trucks and tractors," Neeson said. "You see the sight of 20 to 30 kids with flashlights on their heads and motorbike batteries on their backs going through the garbage. It's just the saddest, saddest thing." After seeing the desperate circumstances of the dump with his own eyes, Neeson vowed to give these poor children a second chance in life to escape their impoverished surroundings. "This country is so broken," said Joseph Mussomeli, former U.S. Ambassador to Cambodia. "It has been 30 to 40 years of a nightmare -- genocide, civil war, foreign invasions, rampant corruption; anyone who has had any education has been annihilated." In 2004, Neeson left the film industry and moved from Tinseltown to Phnom Penh to found the Cambodian Children's Fund, or CCF. "The plan was much more modest," Neeson says of his initial vision. "It was to come here to set up a facility for 45 children, and to raise them to be not just well educated and good parents, but also community leaders." His vision has flourished; CCF now hosts more than 400 children. Funded with private donations and child sponsorships, CCF provides a home, food, health care and job training to children in critical need. The facilities continue to expand and the progress is visible. As executive director, Neeson knows the name of every child and has seen how far they've come since CCF opened its doors. Kunthea, a 14-year-old girl who fled an abusive home, has found her livelihood at CCF. "Sometimes my father used violence on my mother; they fight," she said. "I try to go between them and he also beat me. He used sticks to beat my mother." Kunthea learns English at CCF, as well as food hygiene and nutrition at its Star Bakery. Her passion is being there, making nutrient-enriched breads and distributing them to the local community. Wearing a tall chef hat as she rolls dough in the bakery, filled with the smell of freshly baked cookies, Kunthea seems worlds away from her life at Steung Meanchey. She also volunteers her time teaching village children to read. "In the future, I want to open a shop to help my parents and all my siblings," she said. Neeson has high hopes for Kunthea. She hasn't yet come to terms with her own potential," Neeson said with pride. "I'm hoping that in a year's time she will be looking at doing things much more meaningful for Cambodia." Besides offering a safe haven from the garbage dump, CCF is a place where the children learn computer skills, attend classes and beauty school, and are taught traditional dances and songs. They learn to sew and make bags with their own handmade-in-Cambodia designer label, Srey Meanchey, which loosely translates to Little Miss Garbage Dump. In addition to support at the facilities, CCF has arranged for many of those living at the dump site to have access to fresh water, mosquito nets to help prevent against disease and health care at no charge. These services can be vital to the survival of the families. At the dump site, Neeson found 16-year-old Saroeurn. Motherless, he had called Steung Meanchey his home since he was 3 years old. Saroeurn used to work day and night at the site, rummaging through trash. "He'd work at the dump until he was exhausted and just found a place to lie down amongst the garbage, sleep, wake up and continue picking garbage," Neeson says. "And this was year on year, he was doing this. Saroeurn has become a chef at the local restaurant, Metro, where he cooks steak and other specialties. He serves as a mentor and role model to CCF's younger students, dreaming of life beyond the dump. Nearly every day Neeson continues to makes the trek to the dump site, providing hope in a world that seems hopeless and looking for the community leaders of tomorrow. His new home in Phnom Penh is far from his former lifestyle, hanging with Hollywood big wigs and spending weekends at Catalina. "I had a big motor yacht. I do miss it," Neeson says. "Now I spend Sundays at a garbage dump." In July, Neeson was awarded the Peace Award by the non-profit organization Ambassadors for Children, for his devotion to serving the disadvantaged, abused, and abandoned children of Cambodia. Far from Hollywood, Neeson continues to pave the way for hundreds of children in Cambodia to have their own happy ending. "There is a contentment now and a fulfillment that I would never get anywhere else," he said. "I'm not sure if it's happiness -- I don't know how you define happiness -- but there's a knowledge now that what I'm doing is right and what I was meant to do." PHNOM PENH, Nov. 28 (Xinhua) -- The current situation of Thai politics has affected negatively its border negotiation with Cambodia, said Cambodian Minister of Foreign Affairs and International Cooperation Hor Namhong here on Friday. "I can say that the complicated situation of politics in Thailand has exactly negative impact on the border discussion and plantation of border makers between Thailand and Cambodia," he told reporters after coming back from a regional meeting in Laos. Both sides have already agreed to hold foreign ministers' meeting next month in Siem Reap and the experts from the two countries are also scheduled to measure the land, plant border makers and cleaned the mines near the Preah Vihear Temple during the same month, he said. The resolution of the border matters now depends on the Thai side's situation, he said. "We still need more time and are following the situation in Thailand," he added. In October, Cambodian and Thai troops exchanged fire on their disputed border area, killing two and wounding a dozen. Prior to the clash, the ownership of the Preah Vihear Temple caused both sides to maintain military stalemate near the border for weeks. During this period, rounds of meetings were held, but all failed to find common ground on the border issue to break the stand off. The two countries have 790-km-long border line, but only with 73 border posts which were planted in 1907. The Spitlers expected to carve their turkey this Thanksgiving in the Valley. Instead they gave thanks in two southeast Asian hotels. After a recent trip to the region, the family was scheduled to leave Wednesday through Thailand's main international airport, arriving back in Phoenix with enough time to put the holiday dinner on. Instead authorities cancelled all flights in or out of Bangkok, after local protesters demonstrating against the Thai government swarmed airports and streets and held a sit-in. With the airports closed, thousands of foreign tourists have been stranded for days in the country, waiting for tensions to calm and flights to resume. Danny Spitler, 60, of Phoenix, is among those late in getting home. But his frequent e-mail updates have assured stateside relatives he's safe, along with his fellow travelers: wife Pam, sister Kay, 80-year-old father Irvin and two others close to the family. On Thanksgiving morning, Danny's daughter, Lindsey Spitler, reminded the group to look on the bright side. Be thankful you get to eat the delicious local favorite, fried rice, and enjoy warm weather instead of a blizzard, she e-mailed her dad from her home near Washington, D.C. The group left Arizona in mid-November to visit an elementary school the Spitlers built for poor farm children in Cambodia four years ago. Family members have made trips to the school several times. When their recent visit was over, most of the group continued to Thailand for their flight home. Danny and Pam stayed an extra day in Cambodia, planning to follow. But on Wednesday, the travelers were told at the terminal they would have to wait. Twelve hours later, the airline announced flights were canceled, a bus was outside and they would have to stay at a hotel in the capital. "They were lucky," Lindsey said, since some tourists had to stay farther away. Spitler and his wife found a hotel in Cambodia to hole up in until flights through Thailand resume. No one knows when the family will return. Lindsey said although her father and his wife missed their turkey dinner, their holiday hasn't been too bad. "If I had to pick a place to be stranded, I'd pick Cambodia," Lindsey said. "It's a beautiful place." The illegal trade of rare and endangered monkey species is still rife in Cambodia, according to the British Union for the Abolition of Vivisection (BUAV). The Phnom Penh Post revealed that Cambodia monkeys are being hunted then put in plastic mesh bags and transported to industrial sized monkey farms, which are then rumoured to supply the world's animal testing industry. Footage taken by the BUAV shows individuals taking monkeys from nationally protected nature reserves, including long-tailed macaques, which are listed on the Convention of the International Trade in Endangered Species. Michelle Thew, BUAV chief executive, believes that people will be shocked by the findings. She told the Phnom Penh Post: "There is growing international concern over the plight of primates; we urge the Cambodian government to protect its indigenous [species]." Apart from humans, the macaque is the world's most widespread primate and includes 22 species ranging from Africa to Japan. News brought to you by International Animal Rescue, leaders in wildlife rescue and rehabilitation. GOVERNMENT proposals to sharply increase funds to the military and the prime minister's discretionary spending budget have raised concerns by the opposition party and local NGOs who say the money is being funnelled into corruption-prone sectors and should instead be used to bolster the country's social and economic development. "If soldiers have no shoes, no uniforms, no money, you can imagine where the money is always going," said Sam Rainsy Party lawmaker Yim Sovann. "I don't believe the National Audit Authority is really inspecting the way money is spent." When it meets in early December, the National Assembly is expected to approve a fiscal budget for 2009 that increases military spending from US$224 million to $300 million, and unallocated funds for the prime minister to use on an ad-hoc basis from $196 million to $224 million. The SRP was considering voting against the new budget allocations because they were not included in the spending debate, he added. But he doubted the proposals would be rejected, given the strength of the ruling party's numbers in parliament. SRP lawmaker and spokesman Son Chhay questioned the ability of the government to increase its budget as the country's biggest-earning industries - garments and tourism - brace themselves for a downturn due to the global economic crisis. He said unscrupulous spending by government officials was draining the public coffers and urged the government to close loopholes in tax collection. Companies and the wealthy were withholding large sums of money owed to the state, he said. Son Chhay also warned of a repeat of the military's last influx of new funds, which was plagued by graft. In 2002, the World Bank plunged $42 million into a demobilisation program that went awry. Fabricating tens of thousands of ghost soldiers, government officials pocketed huge sums of money, while many of the real soldiers meant to benefit from the program remained without benefits. The debacle has heightened suspicions over the military's ability to handle funds responsibly. I can assure you the 2009 budget won't go to corrupt opportunists. Chhit Sam Ath, executive director of NGO Forum on Cambodia, said local NGOs were concerned that the new budget allocations overlooked the most pressing needs of the population. 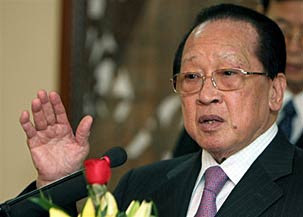 "Agriculture, education and rural development should be the top priorities because they help reduce poverty," he said. 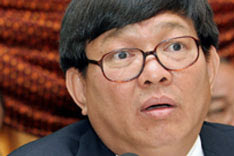 Cheam Yeap, chairman of the Assembly's finance committee, said Cambodia's military budget lagged behind those of other countries, making it vulnerable to foreign threats, and insisted there would be no repeat of the ghost soldier scandal. "I can assure you the 2009 budget won't go to corrupt opportunists. We (the CPP) were elected by millions of people; we have worked to gain the trust of the people," Cheam Yeap said. TOURISM officials said Thursday that flight cancellations caused by the recent political unrest in Thailand have cost the Kingdom nearly 500 international tourist arrivals per day. Mobs with the pro-monarchy People's Alliance for Democracy on Tuesday stormed Suvarnabhumi International Airport and on Thursday closed Don Mueang Airport in Bangkok, prompting airport officials to cancel all departing flights. Ho Vandy, president of the Cambodia Association of Travel Agents, said as many as 500 tourist arrivals would be lost by the disruptions in Bangkok, which would affect travel agencies, hotels and other related services. "The question is who will share responsibility for the loss," he said. Luu Meng, president of the Cambodian Hotel Association, said the loss of international tourists could put a squeeze on the Kingdom's hotel sector. "If the problems in Bangkok continue, some hotels in Siem Reap will be without guests," he said. He added that flight cancellations had left some travellers in Siem Reap without a return flight, and others in Bangkok without service to the Angkor temple town, a key tourist hub. "Phnom Penh hotels have not been impacted much, but Siem Reap could sustain a big impact," he said. Kao Sivorn, director of Cambodia's State Secretariat for Civil Aviation, said between eight and 10 flights from Bangkok to Siem Reap have been cancelled since Suvarnabhumi was occupied by protesters. A soldier unrolls cartridges of ammunition in Preah Vihear in this file photo. Civil unrest in Thailand makes a speedy resolution to the months-old border standoff unlikely. AFTER ratcheting up its rhetoric last month, the government has since resisted taking jabs at Thailand over their disputed territory, even as escalating political upheaval in Bangkok has made progress in border negotiations impossible. "Nothing has changed in our negotiations with the Thai government," said Foreign Ministry spokesman Koy Kuong. "They claim they are fine and still able to communicate [over diplomatic affairs]." The government remains tight-lipped on its ability - or inability - to engage with the besieged regime. "The protests don't affect us. That's their internal dispute and we won't interfere," said Koy Kuong. But as rioting in Bangkok boils over into full-blown civil unrest, forcing the Cabinet to go into hiding and putting the government's foreign affairs on the backburner, Cambodia faces the possibility of losing another chance to advance negotiations over its shared border. Some Asean member states have asked Thailand to postpone a regional summit it is supposed to host in Chiang Mai next month, and the scheduled bilateral talks in Siem Reap in January could also fall by the wayside. Even if the summit is held, Cambodia will not put the border dispute on the agenda, according to Council of Ministers spokesman Phay Siphan. "We're not going to pressure Thailand. Through bilateral talks, we can talk in a friendly way." The government has been advancing a patient line on Thailand's internal turmoil. But this hasn't always been the case during the five-month-old standoff. Hun Sen on October 13 delivered an ultimatum to Thailand that it must withdraw its forces from Cambodian territory, warning of a "full-scale conflict" if Bangkok did not comply. But, after a border clash a couple of days later that claimed the lives of three Cambodians, Hun Sen downplayed the threat of war. Telling reporters that "Cambodia is poor and will not show its muscles", Hun Sen assumed a decidedly humbler tone, which he has largely maintained since. This approach has frustrated Yim Sovann, a lawmaker from the opposition Sam Rainsy Party, who said Thailand's reliability as a negotiator should be raised during the Asean summit in December. "Since July, there have been many meetings but no results," he said. But Chea Vannath, an independent commentator on social and political affairs, said that "while what's happening within each country affects the other in border talks, the reality is that patience is expected". She also said that Hun Sen, while a seasoned veteran in persevering through domestic conflicts, had limited experience in formal international diplomacy, and therefore may still be finding his range in speaking on a dispute that's in the global limelight. Thitinan Pongsudhirak, a political analyst at Bangkok's Chulalongkorn University, thought the Cambodian government was wise to avoid embarrassing Bangkok. "The bottom line is there's no way for an agreement now because the Thai Cabinet and parliament are unable to convene." If Cambodia were to petition for third-party involvement, the international community would sympathise with the domestic difficulties in Thailand that left the hands of its government tied, he said. "Cambodia has every right to do that, but it could damage the long-term relationship between the two sides," he said. Saving face is paramount in Asian diplomatic etiquette, he added, and pressing an already beleaguered regime could be seen as stepping outside the accepted rules of engagement. "The Thai government is falling, so to step on it by pressing it for a resolution would be viewed as adding insult to injury." Cambodian government officials and parliamentarians on Thursday have criticised the recent statement of Global Witness by saying that it is a political and a vindictive statement. The swift reactions from the Cambodian officials happened after the London-based Global Witness has launched an attack on the Cambodian government on Wednesday which urged the donor countries to pressure the government to stop granting the oil and mineral concessions until the Cambodian parliament has ratified the investment laws regarding these two resources. In the last few years, Global Witness has always released its report at the same time when the donor countries meet to provide aid to Cambodia which this year Cambodian planned to request around $US500 million in pledges. Before the Donor Summit last year, Global Witness has released its damning report on Cambodia’s deforestation titled “Family Tree of the Kleptocratic Elites”. In the new report the same Global Witness has criticised that the governance in Cambodia is still very weak. 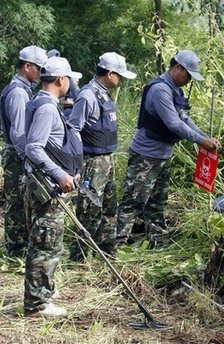 Thai soldiers clearing landmines in Cambodian territories near Preah Vihear temple on 20th July, 2008. A Cambodian official said that there is no one country, among the signatories to the Ottawa Anti-mine Convention, that supports the Thai accusations that Cambodia had planted new mines along the borders. Mr. Phay Siphan, Secretary of State and spokesman for the Council of Ministers, told Radio Free Asia on Wednesday that the Thai complaints to the annual meeting of the Ottawa Anti-mine Convention, which was held in Geneva of Switzerland on the 24th of November, that accused Cambodia of planting new mines has failed to get supports from the participating countries. Mr. Phay Siphan said that the Thai complaints had exposed the Thai lies to the world community. It can also expose the Thai aggression and invasion against Cambodian sovereignty to the world community. Monks and Cambodians from various US states plan to hold a peace march at the UN headquarters in December, aiming to renew attention to ongoing border disputes. The Community Center of Khmer Buddhist Monks will organize the march Dec. 10 to appeal to the UN to honor the 1991 Paris Peace Accords and have its signatories defend Cambodia’s borders. Venerable monk Sao Khorn, head of the Massachusetts center, said Cambodian monks living on pagodas along the border were suffering a violation of human rights and sovereignty. A monthslong military standoff between Cambodia and Thailand is centered around a the Keo Sikha Kiri Svara pagoda on disputed land near Preah Vihear temple, occupied now by Cambodian monks and troops from both sides. Survivors of the Khmer Rouge want justice for those killed and reparation for the rest. Not only survivors, but Cambodia’s younger generation too is seeking reparations for the nearly 2 million victims of the Khmer Rouge. Nobody yet knows what exactly that will mean. Victims of the regime, non-governmental agencies and other participants discussed Wednesday and Thursday the needs of victims, as a Khmer Rouge tribunal moves forward. Some victims said they needed common reparation, such as monuments, schools and hospitals. And they need real justice. Other survivors of the regime, such Chum Mei, a former prisoner of Tuol Sleng, whose director, Duch, is to go on trial next year, and Sum Rithy, who lived through a Khmer Rouge prison in Siem Reap, said individual reparation should be available. 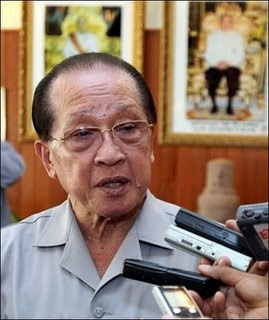 The internal rules of the Khmer Rouge tribunal do not allow for individual reparation, such as awarding cash to victims, but for “psychological” or common reparation. “Compensation cannot be done for individuals,” Kong Srim, president of the tribunal’s Supreme Court, said Thursday. They asked for recommendations for an amendment to the rules. PHNOM PENH, Nov. 27 (Xinhua) -- Experts from the European Community (EC) will meet in February with the Cambodian civil aviation officials over the EC ban of the Siem Reap Airways' flights to its market, an official said here on Thursday. EC banned all flights of the Siem Reap Airways to its countries, because it was gravely concerned with safety standard, Rafael Dochao Moreno, Charge d'Affaires of EC's diplomatic mission to Cambodia, told a roundtable discussion on economic and political cooperation between Cambodia and EC. It also involved the company's technique, training and other confidential report, he said. After EU put it on blacklist, the Cambodian government also banned its domestic flights, he said. "We hope the matter will be solved soon," he added. Earlier this month, EC added the Siem Reap Airways, a local subsidiary of the Thailand-based Bangkok Airways, to its blacklisted airlines, citing its failure to comply with international and Cambodian civil aviation standards. The 5th Cambodia-Laos-Vietnam (CLV) Development Triangle Summit took place in Vientiane, Laos on November 26 with the aim of boosting trilateral cooperation in trade and finance in the region covering ten poverty-stricken provinces of three neighbouring countries. Addressing the opening ceremony, Lao President Buoasone Bouphavanh stressed the need for cooperation among the three countries to be boosted and for policies and mechanisms to be completed in a favourable manner to attract a greater flow of investment into the region. Boosting the triangle region's development would play a critical role in bridging the development gaps between the three countries, he said. Laos, Vietnam, and Cambodia must work together to develop special economic zones across their borders as well as to expand cooperation in the tourism, training, trade and finance sectors. Vietnam's Prime Minister Nguyen Tan Dung expressed his satisfaction at the fine progress in the relationship and comprehensive cooperation between the three nations. He praised the meeting, which he said, offers a good opportunity for the three to review their cooperation in terms of co-developing the triangle region in order to establish orientations and incentives for their investors and those from other countries. At the meeting, the Prime ministers of the three countries agreed to further develop their cooperation in transportation, mining, farm produce production and processing, energy, communications and tourism. The leaders reached a consensus on the triangle development master plan until 2020, which seeks to combine each nation's development plan with cooperation among Mekong sub-region countries, particularly in the above-mentioned areas and in environmental protection. They spoke highly of the memorandum of understanding on the creation of incentive policies and mechanisms to attract more investment to the triangle region. They expressed their satisfaction at the cooperation between CLV plus Japan and vowed to continue working alongside Japan to implement joint projects that have been agreed upon. The three PMs approved a joint statement of the 5 th CLV summit, signed the Vientiane statement and a memorandum of understanding on the formation of incentive policies for the region. The 4 th CLV Development Triangle Summit was held in Vietnam's central highland city of Da Lat in December 2006.